My name is Emma and I used to take lessons from Joell about six years ago I believe. Unfortunately I have not really ridden a horse since, but my experience with horses through Joell has been one of the most valuable in my life. I learned not just about how to ride a horse but about horses. I was able to connect with these wonderful animals, and in particular Coltrane, Olaf, and Legacy hold a special place in my heart. With Joell I learned how to appreciate horses and they became my friends, and are a part of anecdotes in my life that I can tell my friends. Talking about horses that I used to ride is just like talking about some of my old friends from grade school. Growing up, horses gave me something special. I was the girl who could ride a horse in my class. To be known for that was important and exciting to me then. I had some sort of special knowledge that as a preteen I thought made me so much smarter. When I look back at a middle school girl who I consider not to be really “popular” it was an escape for me to go down to the barn every week or so and be with horses, and I loved it. I could be with the horses all day. I didn’t mind the dirt and the smell. I actually enjoyed that. I could go every week and see horses who would remember me, and that for me was the most important thing of all. Now, I am a freshman at Sweet Briar College in Virginia. I go to a college where there is at least one person going to class in riding breeches and boot socks. 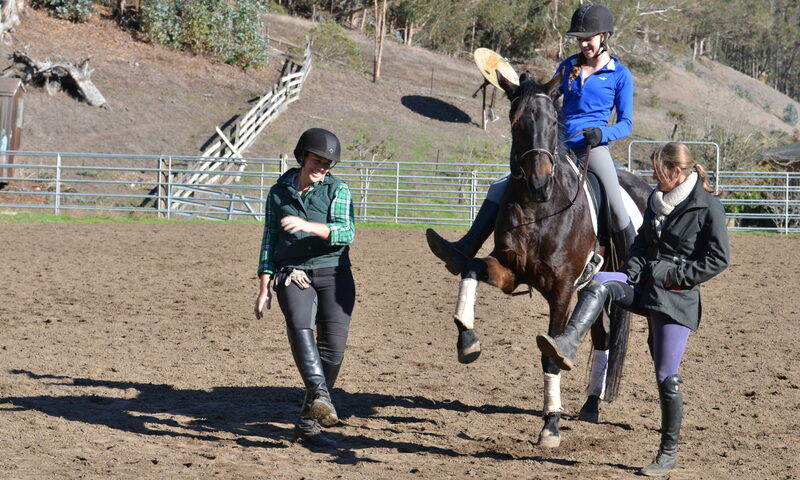 My college is one of the top colleges with an equestrian program and over 50% of the students take lessons on campus. The school has a whole of about 90 horses on campus and 3,280 acres filled with trails into the mountains. A good majority of my friends ride horses competitively and it has been a part of their lives since they were children. Even though I don’t ride any more I am still able to connect with them because I know about riding horses. I understand the terminology that they use, and I know how to act around horses. My friend said to me “I really appreciate you knowing what a girth is because most of my non-riding friends don’t know anything about any part of the horse.” I am thankful for the knowledge that I gained while riding with Joell because I have much more in common with the whole of my student body than I would if I had never ridden a horse. I enjoy going up to the barn with them, and I am the official picture taker at shows. I’ve been the taxi service out to the barn so many times that I pray for rain so that the water will wash off the dust caked onto my car. But I don’t mind. I enjoy being around horses, and I enjoy the sounds and smells of the barn. It is a weird thing, since I don’t ride anymore, but for some reason I am always happy at horse barns. There is something very tranquil there for me. I guess it is because for me horses are more than just an animal that I am supposed to like and dream about because I am a girl, but I see horses more as friends than animals. With horses there is more of a partnership in riding, much more than you can have with a pet dog. A horse has to trust you as you have to trust them. To me this is what makes horses so special. I am still a little envious of my friends who can ride so well, but I am also thankful because they have brought horses a little bit back into my life, whereas before I was mostly admiring horses from the windows of my passing car. My past with horses has given me so much in my life. It is amazing because it is one of the highlights that I think about when I think about my childhood. It is something that I will always enjoy. Previous PostPrevious If I Donate to Square Peg, where does the money go?